Week four in the Connected Courses MOOC delved into the origins of the Distributed Open Collaborative Course (DOCC) in the FemTechNet academic community. 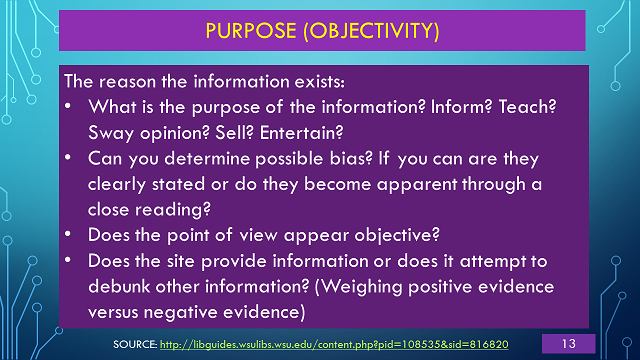 A prescribed student audience with one class of qualifications, like a closed wiki, which limits universal use of the learning materials and easy adaptation of results. Instructors with closely aligned professional or institutional bonds, stopping short of broader collaboration. Broader theoretical exploration limited by institutional or MOOC “brand” boundaries. The organization of a DOCC addresses the collaborative nature of learning in our digital age, our always online and connected anywhere in multiple simultaneous platforms. DOCCs are built on acknowledging that expertise is distributed throughout a network, among participants situated in diverse institutional contexts, within diverse material, geographic, and national settings, and with diverse roles for organizers. There is no single credit granting institution. Credit is contextually offered to students through local campus mechanisms that are already established. The education of teaching librarians that produce information literacy training is one opportunity to think about considering the broad networked expertise nature of the DOCC platform. 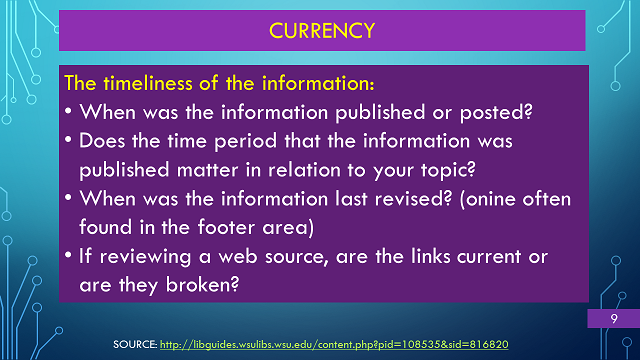 Most librarians are already familiar with wiki sites as a static way to share documents, links, or techniques. 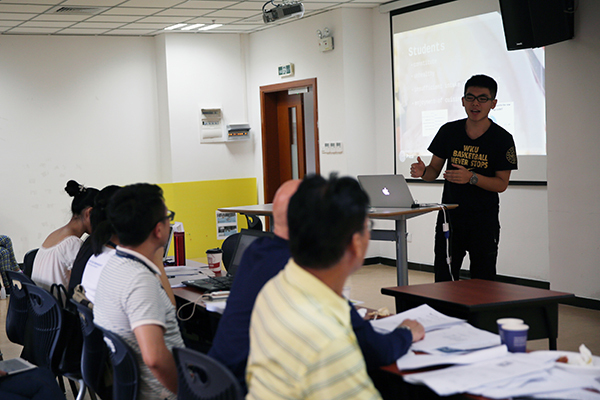 The shorter-term nature of the DOCC might bring together affiliates from a variety of professional organizations like ALA, MLA, the National Library of China, etc.with their own particular take on literacy and competence with information to focus on a particular broad goal. A second way to think of how the DOCC model might produce a better experience than a MOOC would be for several partnered academic institutions to leverage their most effective information literacy teachers and offer a common segment of information literacy training as a common core lesson at all schools. All of the students at the partnered institutions would access common centralized and scheduled elements, yet also have their local ability to award credit. For instance, my own institution offers “co-curriculum” credit for optional activities, and I myself have been able to award this credit for one series of library literacy classes. Another partner institution might include the DOCC course as a substitute for a library lecture in academic classes. This is the whole point of the DOCC: diversity, not shoehorn every aspect into one MOOC template. I have listened dutifully listened to three connected courses recorded webinars on The World Wide Web – From Concept to Platform to Cultures. There are recordings of sincere consultants, academic technologists, and educators that have interesting perspectives and experiences, but as the organizers and protagonists for our adventures in connectedness, they tend to be going to their memory book and providing a great deal about back in the days when set up a server in my closet and taught my students how to turn a hamster cage into a router. The web literacy experts at every school or university without an academic or learning technology facilitator is usually a librarian, an information professional that may not have set up a server in a bedroom closet. But they teach information and web literacy, recommend web applications, plugins for Firefox, and feel great joy in making staff and teachers more productive in their work with students. But lacking the coloratura or flair of technology specialists and the need to maintain traditional collections of print materials (the most portable and resilient knowledge format, requiring no recharging), they tend to blend in with other good deed doers and even get marginalized by misperceptions that the digital library has already replaced the non-digital library. “The largely autonomous Kurdish region of Iraq has become an open, cosmopolitan, forward-looking place with a booming economy – construction cranes, car dealerships and fast food chains sprout up every day. Now lets transform the subject, but not the unabashed support, substituting one marginalized group for another. The largely SELF-SUFFICIENT LIBRARIAN has become an open, cosmopolitan, forward-looking ANCILLARY TO EDUCATION with a booming FOLLOWING — CLASSES, OFFICE HOURS and LIBGUIDES sprout up every day. The LIBRARY IN A SCHOOL OR COLLEGE SETTING is a RESPECTED PROFESSIONAL marked by a modern educational outlook and open dialog. LIBRARY leaders have been responsible in their efforts to secure their future – not declaring A DEFICIT OF CAPACITY, working to ENSURE STUDENT ACCOMPLISHMENT, supporting EXTRACURRICULAR efforts for STRUGGLING STUDENTS. They have been a force for stability in CHAOTIC UNDER SOURCED ACADEMIC SETTINGS. One of the lessons of American HIGHER EDUCATION over the last six decades has been that CURRICULAR interventions work when INSTRUCTORS ARE SUPPORTED by LIBRARIANS, WHEN LIBRARIANS and INSTRUCTORS want to fight for their STUDENTS’ cause. Think of CLASS-COORDINATED LIBRARY INSTRUCTION compared with NON-LIBRARY RESEARCH LECTURES – they don’t work when the LIBRARIANS simply ARE NOT INVITED. Please acknowledge that well-intentioned librarians in academic settings are not as marginalized as well-intentioned Kurds. 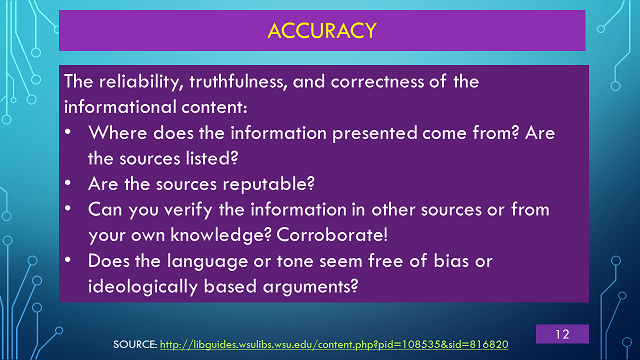 Can we get connected with teaching students how to evaluate sources? 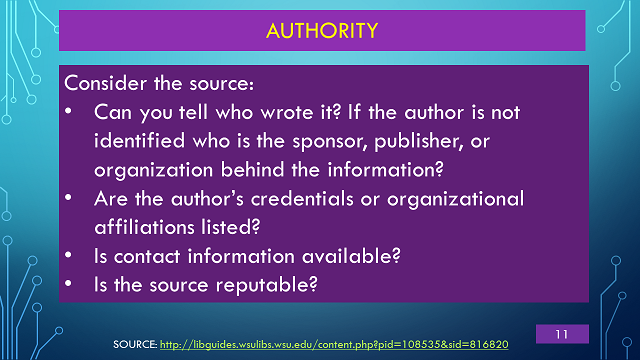 How do librarians teach how to evaluate sources? The Washington State University Libraries call it the CRAAP test. I like the CRAAP model of organizing the problem at hand: there is simply so much not to trust that gets delivered to students through their favorite search engine, the kind that display paid ads as preferred sources. A high degree of skepticism can also be applied to results that do not contain explicit advertising . Here are a couple results from my own computer using Google and Bing. What topic did not care to provide any advertising whatsoever? 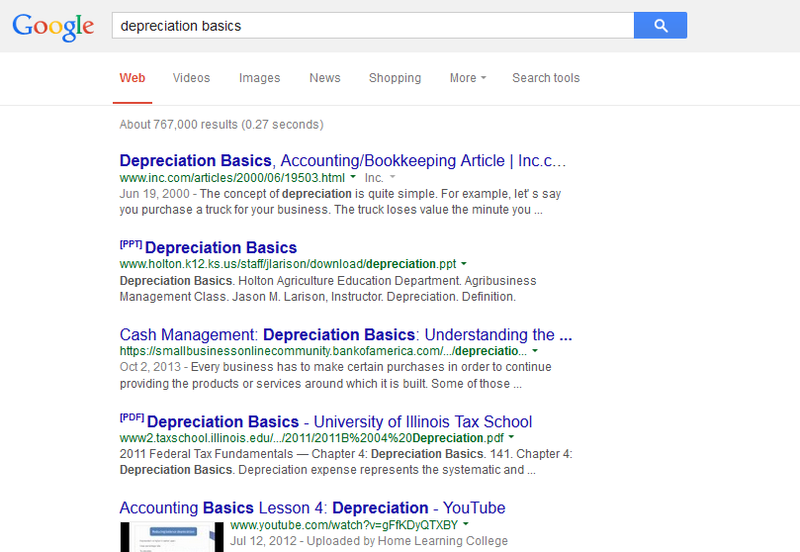 DEPRECIATION BASICS. 70% the students at my school are aiming for a business profession. But there is no history on my computer of looking up this topic. 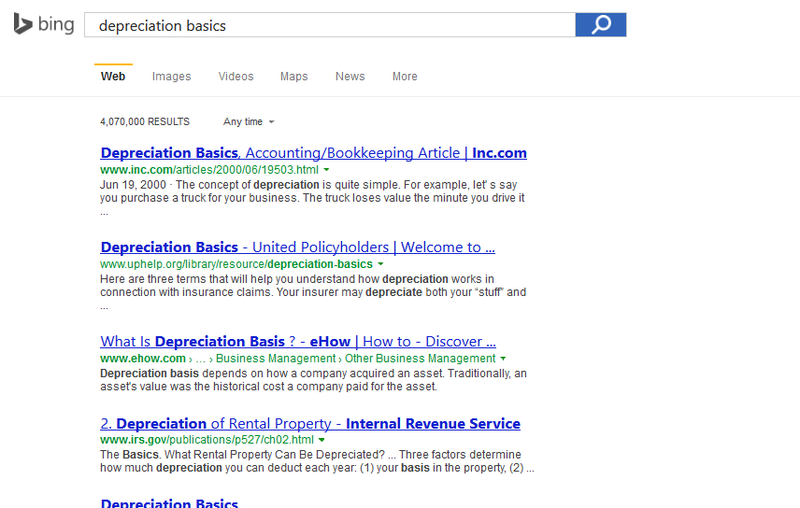 Interesting how both search engines have the same link as the the top result, yet below that there is also quite a difference. So how do we want students to approach the notion of trusting one of these results or using it to contribute to the answers it will provide for their assignment, paper, class discussion, or group assignment? Yes, some dedicated librarians and I establish all the possible problems that might exist in a source on the web. But how to get the learner (the student, sometimes the faculty) connected with a laundry list? This what I tried last spring: for the last 20 minutes of the session I asked students to work in pairs, then I showed them three qualitatively questionable web sites. I passed out a rating scale sheet and asked them to try some of the CRAAP criteria and be prepared to share their opinion. After a few minutes with the first site, I lead a discussion which asked for volunteers to talk about their evaluation experience, even if it was only the rating score. The lesson on evaluating sources was one of five classes that qualified students to take an open book quiz and earn my institution’s co-curricular credit for an 80% correct answer rate on a 25-question quiz covering all units. I hoped the quiz would bring them back to review the material a second time, or perhaps even use it during the quiz. In case you were wondering, 31 students completed the extra-curricular classes and the quiz. Now, it is much easier to program this kind of extracurricular activity and avoid the time-consuming but more connected work of doing a similar activity in a class-coordinated setting. As the only current qualified information literacy teacher and simultaneously the Library Director, I did not try to get into a classroom, particularly if I could not get into every classroom. So I opted to find shared-purpose, peer-supported, interested-powered students. But what they were doing was not openly networked or production-centered. 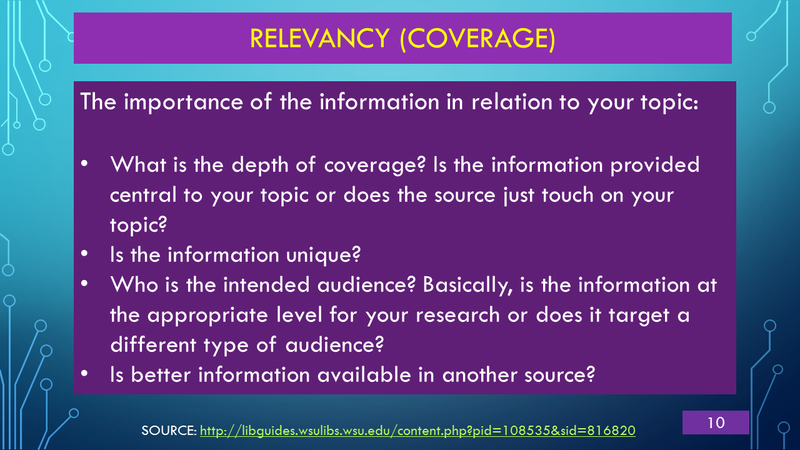 Let’s start with the low-hanging fruit of information literacy education, teaching students how to make a functional container for research discoveries. I call it a container in the classes I teach. A citation management tool such as Zotero, Endnote, Refworks, or others allow students to MAKE a personal database of metadata records and full-text documents which can be turned into formatted bibliographies and other outputs. If we were going to demonstrate connected learning principles with students making citation collections, I would have to give the advantage to Zotero, a non-commercial product with considerable support from educational foundations. Private groups provide a means of collaboration among group members without creating any public face for the group online. 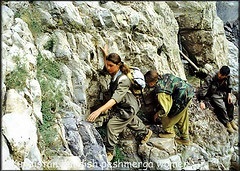 Only group members and users invited to join the group are able to see the group’s page. Private groups are completely hidden from group searches. They are not shown on members’ public profile pages and will not appear in search engine results. If administrators enable file sharing, group members can access and share files in addition to references. Closed-membership groups are useful for creating a controlled group environment with a public presence. This allows a group to publicly present its work and sources, or develop new membership in a controlled fashion. Anyone can view the group page, but the only way to join the group is by invitation or by requesting an invitation. If the group has a library, administrators can choose to show or hide the library from non-members. Open public groups are useful for the broadest discussion and collaboration. The group page is public, and anyone who wants to can join instantly. Open public groups do not allow file sharing. I once taught a graduate school class exercise using Diigo for a assembling group knowledge. At that time I didn’t know it was also an easy fit into the Connected Learning paradigm. More about Diigo in a future post. So for those of you creating #ccourses, think about that citation management lecture your librarians bring to your classroom and how students working in groups could build collections of discoveries and share them using a Zotero group. One of the nicest opportunities presented to me on the occasion of my first birthday celebrated in China was made possible through the generosity of our Wenzhou-Kean University University Affairs office. They offered me a chance to invite and have a catered dinner with as many students as I would care to invite. I have an open door policy and know many students, including the ones that work in my library. 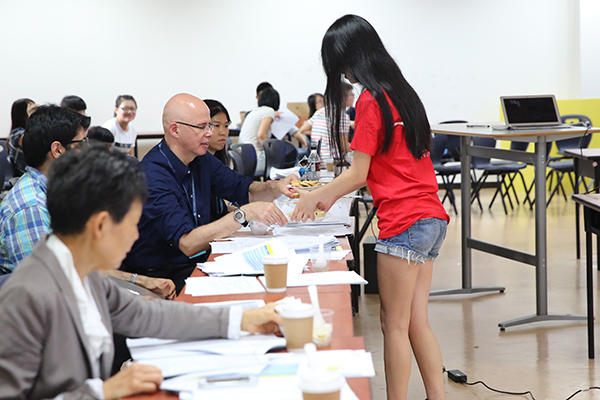 There are also friendly and accomplished student ambassadors that lead campus tours, and those students that go out of their way to make me feel welcome in China. I filled two tables of twelve, and my only regret was that I could not clone myself and sit at both tables. My table got beyond the “What did you do on your summer vacation?,” and I told them some stories from my training expeditions to Armenia. The rotating centerpiece of delectable Wenzhou food is getting picked at, mostly by hungry me. Then I start to think to myself what my next icebreaker will be…. BINGO! Do any of you know about what is called connected learning? I start to try to find the pioneers at my party table. I ask, “How many of you have a hobby or an activity where you make things?” I think of my own daughter, recently out of college, that would spend many dedicated, focused hours to making beading wrist bands and necklaces. Chinese students, experiential-trained to hold back, are not going to fight to be the first one to admit something. But I know many of these students from personal conversations and know some of their talents and goals. They are each very unique, and most of them are driven to succeed in English-language higher education. So I decide to start to ask them to reflect on things they like to do, things that they like to make or create. Several don’t want to speak but gently nod their heads, as they want me to know they are engaging with the discussion. I describe interest-powered engagement with learning, the common sense that when college assignments allow you to express your own intrinsic interests, the quality of your efforts and the amount of retentive learning that takes place is greater. I remind them that the recent Sharktank Business Plan student competition in the School of Business allowed them and other students to bring their own entrepreneurial interest and role to an optional student team activity. Students chose to create sample products, sample menus, floor plans, consumer surveys, video marketing, and projections of inventory, cost, and profit. Now at a birthday party you can’t get too serious. So I simply closed the discussion with the advice that there will be many classroom assignments that will give you choice, and it would be in your own best learning interest to select an a corner of your life that you are passionate and engaged about and bring it into the assignment. Yes, I used my captive student audience at my own birthday celebration to launch the my fall of Connected Courses. Not a bad birthday present. 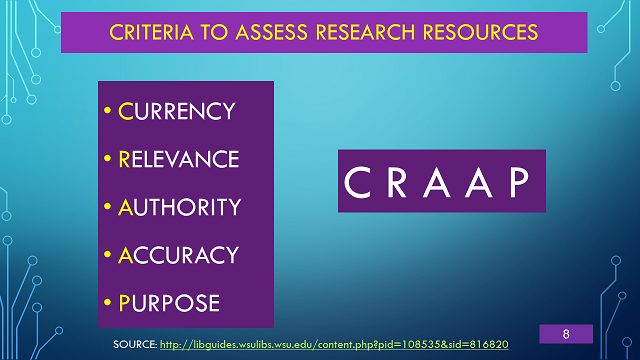 Linda and thousands of other information professionals have take their launching point from the Association of College and Research Libraries’ (ACRL) Information Literacy Competency Standards for Higher Education (“the Standards”) , first adopted in 2000. ACRL decided to engage in a process to take into account the big changes we also identify with CONNECTED LEARNERS. The ongoing process has been accompanied by persistant calls to develop new approaches to describe the CONNECTED world of online knowledge that goes beyond the core standards of articles and databases and bibliographies to represent student research findings. Metaliteracy describes the confluence of transliteracy, media literacy, digital literacy, all with the possibility of students making and creating things. This blog will hopefully continue the discussion.